Some breast milk storage guidelines need to be followed to preserve the maximum nutritional value of the milk. Fresh breast milk is pretty stable. It doesn’t spoil as fast as thawed milk. However, it needs to be cooled down and refrigerated if not used immediately. When choosing containers to keep your pumped or hand expressed milk in, decide between glass and polypropylene (cloudy) bottles. I love glass bottles, so I chose to go with glass to begin with. Then when my son was able to hold the bottle we switched to plastic to prevent breakage. Glass bottles are heavier. Stay away from clear plastic (polycarbonate) bottles. These contain BPA (bisphenol-A) – a chemical known to lead to many potentially serious health conditions, including cancer. BPA leakage is most active when polycarbonate is heated or frozen and defrosted. And this is exactly what we do with breast milk. Avoid using other clear plastic containers for breast milk storage besides bottles. 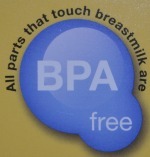 Look for “BPA-free” on baby products (see picture for an example of a "BPA-free" sign on Medela pump accessories). Use pre-sterilized storing and freezing bags for freezing your breast milk. They take less space. Most of them have a double zipper seal to prevent leakage. There is also a spot to write the date the milk was collected and the volume. I used Lansinoh Breastmilk Storage Bags. I tried many, but this one proved very durable (due to its thickness) and the easiest to handle. It is designed to ideally only hold 6 ounces with enough room left for milk to expand. Important: Milk expands when it freezes. That’s why it is important to write the volume on the bag: this way you will know how much milk you'll have after thawing. This is also why you need to leave some room in the bag when filling it with milk. Here are my 6 ounces just poured into a bag and then the same 6 ounces frozen. Doesn’t quite look like 6 ounces, does it? If you need to add fresh milk to the one already refrigerated or frozen, cool it down first to prevent defrosting of the older milk in the container. If you only pump small portions during the day, it is best to keep a bag with milk in the fridge. After chilling add fresh milk to this bag throughout the day. Then freeze it in the evening. 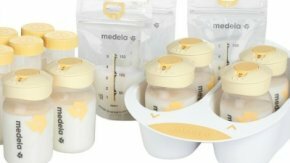 Breast Milk Storage Time: Where and How Long? It is recommended that pumped milk is kept at a room temperature for no longer than 4 hours. After that it needs to either be refrigerated or frozen. If possible it is best to refrigerate milk right away and then warm it up before “serving”. If you don’t intend to use your pumped milk within 4 hours and there is no refrigerator, you can keep it cool by placing it in an insulated tote with an ice pack (some pumps come with one). It can be safely kept there for up to 20 hours. Some studies show that breast milk remains intact if left at a room temperature for up to 10 hours. Don’t test it, if cooling down or refrigeration is available. If you know you will give the milk to your baby within two days, you can refrigerate it (no need to freeze it). Keep your milk at the back of the refrigerator where it is the coolest. After 48 hours it needs to be frozen. If your freezer is inside the refrigerator's main compartment, milk can be safely kept there for up to 1 month. If it needs to be frozen for longer than that, keep it in the freezer separated from the refrigerator's main compartment with a door. Milk can stay there for up to 6 months. After 6 months it is still safe to use, but fats in the milk start breaking down, so it starts losing its nutritional value. If you need to keep your milk frozen past 6 months, transfer it into a deep freezer (if available). Breast milk storage is easy to manage if you create a good system of dating, freezing and defrosting the milk. Visit Defrosting Breast Milk section to learn how to thaw milk.